Clinical background on the new CER requirements. Clinical background on the new requirements. 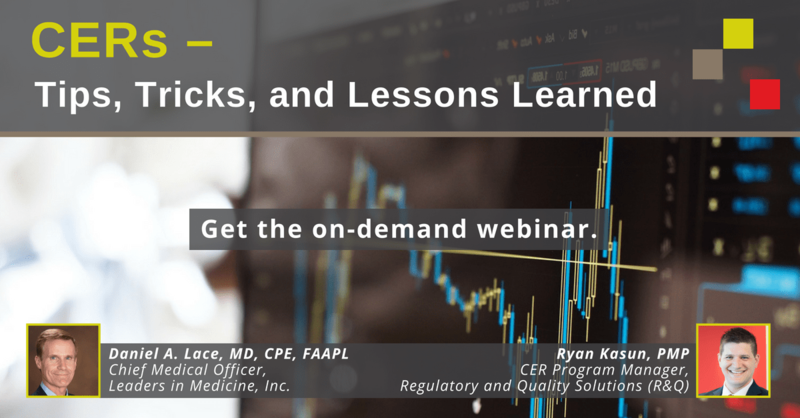 This webinar was originally presented in May of 2018 and is now available on demand. "It was excellent. Lots of good information. Our process has been reviewed a few times by our NB with no issues, but there are things you guys presented that will make our process even more robust. So, thank you. Well done." "Fantastic presentation. I've been struggling with SOTA for some time, and it really helps to learn how other writers are approaching the issue." "Good Job guys!!! I really like the way the webinar is structured." "Very good presentation. Thank you!" "Very good - like/agree with the point that the audience for CERs is the notified body/auditor." You have heard about the increased requirements for clinical evaluation with MEDDEV 2.7/1 Rev 4 and the MDR. You may be working on new templates and updating your CERs. What do these requirements really mean? How are we going to get this all done? In this webinar, you’ll get the clinical background on new CER requirements from Dr. Dan Lace. Dr. Dan brings a physician’s perspective to unpack concepts like “state of the art” and “sufficient clinical evidence.” He’ll talk about how clinical evidence informs clinical practice, and how evidence-based medicine techniques are applied to CERs. Then you’ll get insight on the mechanics of putting these concepts into practice from Ryan Kasun, CER Program Manager at R&Q. Ryan will talk about the lessons that R&Q has learned as we’ve walked alongside our clients through the MEDDEV 2.7/1 Rev 4 transition, and he’ll give tips and tricks for the next transition to MDR compliance. What is evidence-based medicine, and how does it relate to CERs? What does “state of the art” mean, and how do I write about it in my CERs? What is “sufficient clinical evidence,” and how do I know if I have it? What are notified bodies saying?